Govan is an interesting station as it is effectively both a station and the main control point of the subway network. The building that houses the Govan subway station also doubles as an office and staff space. This is where all the drivers of the trains come in the morning to get on their trains as the overnight rail storage for the trains themselves is somewhere between Govan and Ibrox. You can see some lit up side tracks as you go past in the tunnels. When service actually starts, the first trains hit Govan and Ibrox respectively. 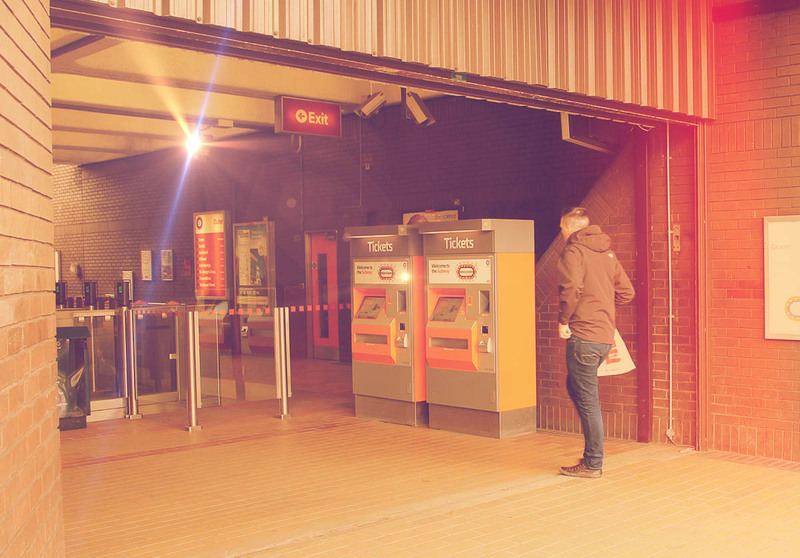 The entrance to Govan Station. 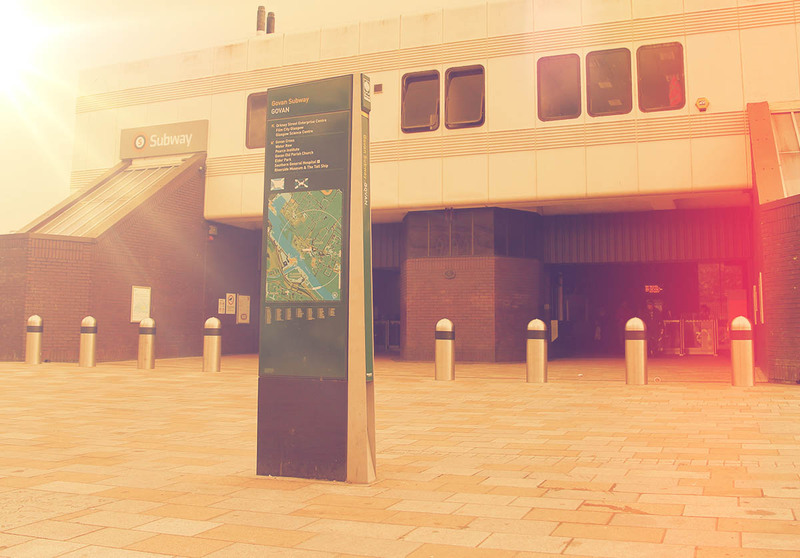 The station itself sits directly next to Govan Cross and as you come out of the standalone building you will see the cross in front of you, with the ranks of Govan bus station extending to your left. The services that arrive and leave from the bus ranks will travel to a variety of places to the south and west of Glasgow. It is an important hub point if you are travelling out to some of the Glasgow suburbs. The entrance to Govan Station – wide view. Once you exit the station, directly in front of you runs Govan road. If you follow it round the main area of the cross an attached shopping centre will open up on your left. The Govan Cross Shopping Centre is the heart and soul of Govan and while it is certainly not the most exclusive of shopping locations in Glasgow, it has a number of interesting shops worthy of browsing. 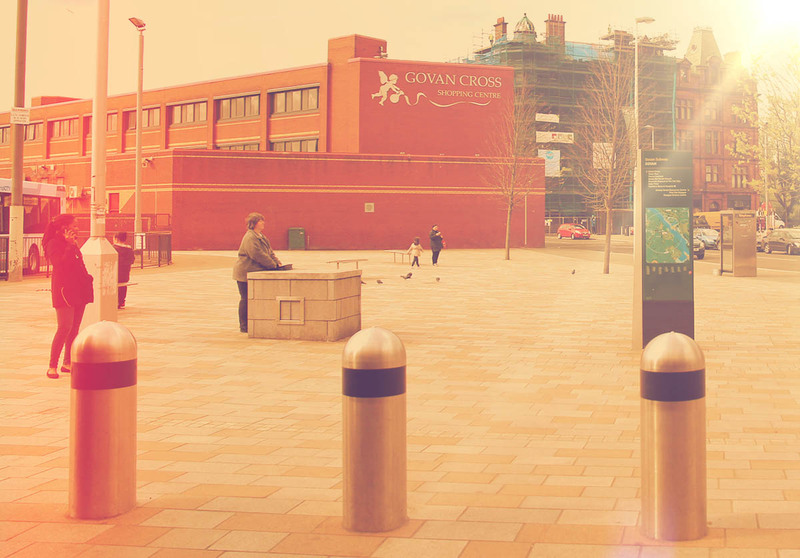 Govan cross shopping centre, directly outside the station. The Post Office and Iceland supermarket are probably the main draws but there are some bargain pound stores and a charity shop as well. In an age where post offices are a dying breed, having one nearby is priceless. Just across the road from the shopping centre is the Pearce Institute, an important community hub in the area and part of the traditional fabric of the place. It has been there since 1906 and still strives to help the local people of Govan with valuable support and help. There is not much left of the original Govan now that the heart of Glasgwegian shipbuilding no longer beats as strongly as it once did. There is still a shipyard owned by BAE Systems further along, just after the roundabout that splits Govan Road. If you look hard enough, you can still see the faint embers of the industry there, even if the yard itself appears crumbling and neglected. The River Clyde is directly north from the subway station and runs parallel to Govan Road. There is a small ferry that runs across the short stretch of the Clyde just up from the station which leads to the Riverside Museum, a state of the art facility that illustrates the history of shipbuilding on the Clyde. In the past, almost the whole stretch of riverside frontage would have been turned over to shipbuilding with thousands of men employed there. No longer. For subcrawlers, it’s usually the Brechin Bar which is the building in the middle of the road fork just after the shopping centre. This is the old man of old man pubs, but is usually good for a bit of fun with the locals. Even the most irreverent of subcrawl revisionists will have to admit – no crawl is quite complete without a trip to the Brechin. 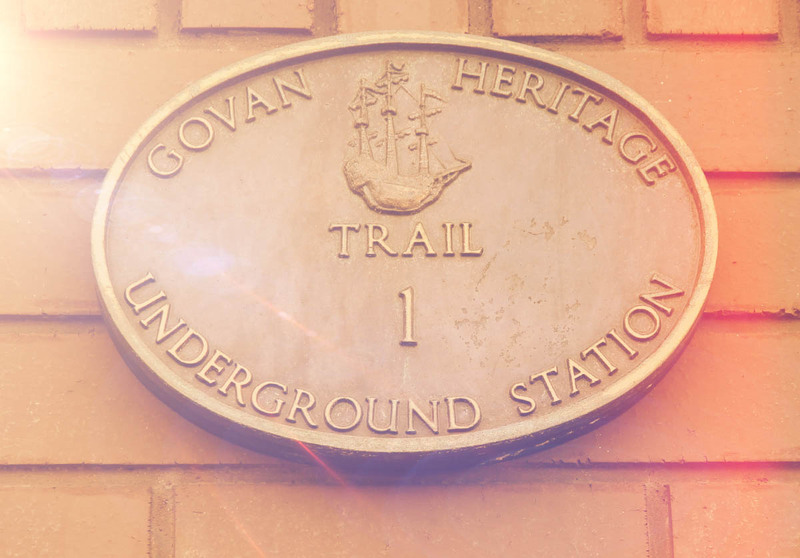 The Govan Heritage Trail, plaque number 1. I once joined a subcrawl which was grossly unprepared for a sudden cooling of the days temperature as we worked our way round. When we got to Govan we all piled in to the charity shop at the shopping centre and bought tweed grandad jackets and pork pie hats. A quality night out was had. 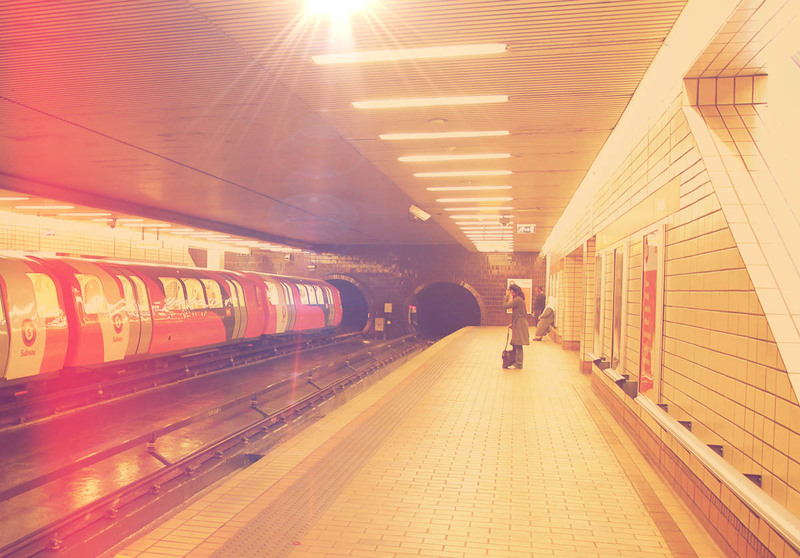 Overall, Govan is by far the largest station on the network and acts as the furthest stop away from the City Centre. Given that Govan is the old ship building capital of not only Glasgow but Scotland as a whole, it is well worth your time if you have any interest in the history of Glasgow. What’s more, Govan is about as down to earth an area of Glasgow as you’re likely to get.